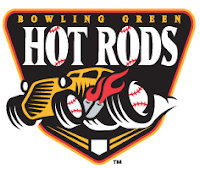 Fort Wayne, IN - Brett Nommensen homered and drove in four runs to lead a massive Hot Rods attack on Sunday night in Fort Wayne. But, the Hot Rods bullpen gave Fort Wayne fans an early fireworks show allowed ten runs over the final four innings to hand the TinCaps a remarkable come-from-behind 12-11 win to open a three game series. The Hot Rods used a big second inning to jump out to their early lead. The frame took place after Fort Wayne scored a run in the bottom of the first against Kirby Yates. To start the second Ryan Wiegand doubled down the left field line. Mark Thomas followed with an infield single that was accompanied by a throwing error to score Wiegand and place Thomas at second base to tie the game at 1-1. Gabe Cohen stepped up next and drove a single into right field, scoring Thomas to put the Hot Rods up 2-1. After Dustin Biell singled to right, Kyle Spraker laid down a would-be sacrifice bunt to third. However, third baseman Edinson Rincon airmailed the throw to first base, allowing Cohen to score from second and leaving Biell at third and Spraker at second base. After a fly out by Ty Morrison, things got ugly. Brett Nommensen stepped to the plate, worked the count full, and then belted his team-leading seventh home run to deep right field to put the Hot Rod son top 6-1. Once Nommensen homered, Sullivan lasted just one more batter when Robi Estrada singled into center field. Jon Berger came on in relief and didn't fare a whole lot better. Estrada stole second before taking third on Tyler Bortnick's single to center field. Wiegand then came up again for the second time in the inning, driving home Estrada for a 7-1 lead. Two batters later, Cohen's second hit of the inning, a double to left, bumped the lead to 8-1. All told, the eight-run inning was the biggest of the season for the Hot Rods, surpassing their seven-run 7th in Wisconsin on June 9. They picked up nine hits in the inning with a home run, two doubles, and six singles. As a team, they went 6-for-9 with runners in scoring position. Handed a seven-run lead after an inning and a half, Kirby Yates was able to settle down. He retired eight straight from the end of the first to the top of the fourth. With one down in the fourth he put two runners on with a pair of walks before inducing an inning-ending double play. The Hot Rods added another run in the top of the fifth against relief pitcher Miles Mikolas. Biell singled to center field, went to third on an error, and scored on a single by Nommensen to bump the lead to 9-1. Yates allowed one more run in the fifth before working out of a bases-loaded jam with a 9-2 lead. He went five full to earn his second win of the season, both coming out of the starting rotation. The righty allowed a pair of runs on three hits, four walks, and three K's. From there, it was a battle of the bullpens. The Hot Rods 'pen gave up three runs in the last of the sixth to cut the down to 9-5. But Bowling Green came right back in the 7th and scored runs on a sacrifice fly by Estrada and a single by Bennett Davis to push the lead back to 11-5. The TinCaps then did the rest of the scoring, getting two runs in the seventh against Mavarez before the right-hander pitched a scoreless eighth. In the ninth, Alex Koronis came on to close the door and nearly did so after giving up a pair of singles. With one out, he induced a ground ball to shortstop that was tailor-made for a double play. Instead, the ball was misplayed for an error by Robi Estrada, loading the bases. At that point, Koronis had trouble finding the strike zone. He issued three straight four-pitch, bases-loaded walks to cut an 11-7 lead down to 11-10. Then Jeudy Valdez came up and bounced a weak single through the left side to plate two runs and give the TinCaps the 12-11 win. The teams meet up for the middle game of the series with a Monday afternoon matinee. RHP Alexander Colome (5-5, 2.81) takes the ball against Fort Wayne LHP Mike Watt (4-4, 3.38). First pitch is at 2:05 PM CDT. You can listen to the game with Tom Gauthier beginning at 1:50 CDT on 1340 AM WBGN and www.bghotrods.com. Looks like more of the same today, keep giving back the lead, 6-5 top 5. Cody Rogers The beast is back! 4 for 5! 2 HR's, single, and a double! 4 rbi's nice Hot Rod Debut! ROCK ON!